Peter F. Hamilton introduces the first novel in his upcoming series. 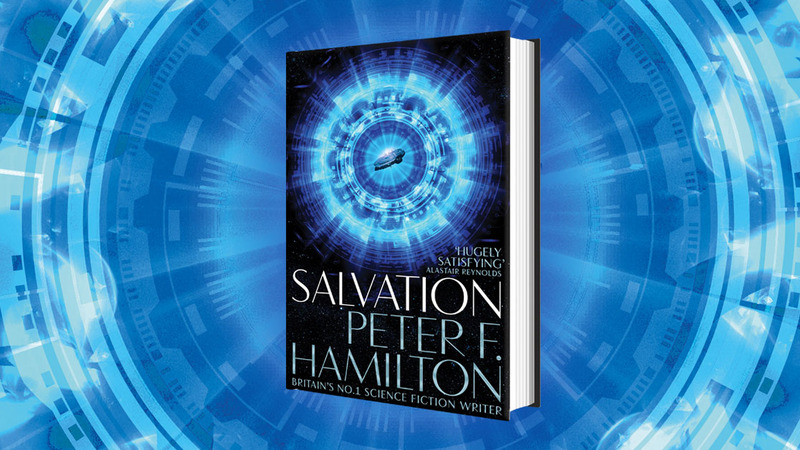 Salvation, the first novel in Peter F. Hamilton's new series, is now available. Here, he introduces the new world he has created and we discuss his other not-to-be-missed works. Peter F. Hamilton creates epic, thoughtful and frequently optimistic science fiction. In addition to his children’s books, novellas, short stories and lore companions, his 19th novel, Salvation, is available now. He’s a titan of modern science fiction and shows no sign of slowing down anytime soon. Salvation marks the gripping start to a new series, The Salvation Sequence. It’s a perfect jumping-in point for anyone new to Hamilton – full of his customary diverse cast, high intrigue and a utopian society under threat from within and without. It also plays with what is now fair to call a Hamilton staple: portals. For those looking immerse themselves further into Peter's numerous acclaimed works, his debut, the Greg Mandel trilogy is certainly not to be missed. A more private-eye tinged and less planet-hopping series than he would come to be known for, this trilogy tackles such themes as post-cataclysmic Britain, psychic warfare, communist dictatorship and personality cloning. While a common theme in his latest release, portals are also explored and used to great narrative effect in the Commonwealth Saga – Hamilton’s most ambitious and numerous series, running to a trilogy and five other books. Indeed, wormholes seem key to Hamilton’s style; they allow for galaxy-spanning narratives and huge supporting casts while still feeling immediate and intimate. Make no mistake – while avoiding the traditional hard science fiction staple of lengthy scientific exposition, Hamilton is still concerned with big ideas. The Commonwealth Saga’s opening novel, Pandora’s Star, alone takes in Dyson Spheres, alien entities with networked consciousnesses and of course, the ramifications of intergalactic war. Two more things that set Hamilton apart is his willingness to play with genre conventions, and to construct imaginative and sprawling future societies – both of which exemplify his Night’s Dawn trilogy. The lethal rivalries between factions and giant sentient space habitats are one thing, but the real twist to this series is that of possession. An ancient menace, thought to be superstition, is revived thanks to alien intervention and proceeds to wreak havoc across the galaxy, providing fertile ground for some mind-bending future-physics and realpolitik. So, start at the one of the beginnings. It won’t take long for you to become lost in one of his universes, and don’t worry – you won’t be running out of them very quickly either. Kicking off his newest trilogy in a new universe, Salvation sees a ragtag bunch of rivals drawn mostly from the ranks of the monopolistic portal producer Connexxion Corp investigating an alien shipwreck at the fringes of reachable space. Of course, the secret at the heart of the shipwreck could mean that not everyone is who they say they are. Salvation kickstarts a thrilling new space opera trilogy tinged with detective elements and a parallel far-future narrative that raises as many delicious questions as it answers. This is the place to jump in as a new fan – it’s one of his best and you’ll get to experience the unfolding action as it happens. The first entry in the Commonwealth Saga, Pandora’s Star is the natural entry point into a sprawling saga – especially if you want something to binge read with no wait in-between books! It’s full of tantalisingly drip-fed mystery, folding in influences from outside the genre including mysticism and compelling, painfully believable flawed characters. It also has Dyson Spheres, which are just always awesome and full of secrets. It’s not a light read in the literal sense – Hamilton’s books are big – but the sense of journey and discovery throughout makes this novel really fizz. As well as being one of the most intriguing novels/series in his oeuvre, The Reality Dysfunction, book one in the Night’s Dawn trilogy, is told so intimately and from so many contrasting perspectives, it’s weirdly one of the most immersive and believable. The Night’s Dawn trilogy contains some of Hamilton’s finest blurring of lines between science fiction and more fantastical elements. Also, despite its impressive length, The Reality Dysfunction drops readers right into the thick of things and introduces them quickly to Voidhawks, living starships whose influence can still regularly be felt in other authors’ contemporary genre novels. For a full list of Peter's series and standalone books, click here.